Traditionally, the NFL's General Managers, Head Coaches, and Staff members who are on the "Hot Seat" are quick to get burned following the league's last regular season Sunday. That final NFL Sunday of 2012 has been played, and for the teams in some sort of disarray it is followed by the next day's sunrise, referred to as "Black Monday". It has come to the attention of most that a man by the name of Jeff Ireland of the Miami Dolphins is one that a majority of their fans would like to see burnt to a charcoaled crisp on New Year's Eve. Jeff Ireland has been the team's General Manager since 2008. He was hired by, and under the influence of, Bill Parcells through the entirety of 2009. Ireland took over control of team management upon the beginning of the 2010 offseason, bringing in player acquisitions that played to the level of 7-9 in 2010 and 6-10 in 2011, leading to the firing of the head coach. In 2012 Jeff Ireland, on his own accord, hired the Miami Dolphins present and first time head coach Joe Philbin, who happens to run an entirely different system to that which Ireland has been accustomed to during his career. This type of hiring might suggest that the general manager has recognized the error in his ways. For the first time in his Dolphin tenure he has permitted the head coach to influence him in all Dolphins endeavors, from the hiring of offensive coordinator Mike Sherman, to the drafting of a first round starting quarterback Ryan Tannehill, to the trade of Vontae Davis and the release of speedster wide receiver Clyde Gates (two guys who were both Ireland favorites). Since the new coach runs an entirely different scheme requiring an entirely different type of player, it would lead one to believe that the general manager also afforded Philbin more than his say in free agency and the 2012 draft. Everyone knows that, from top to bottom, a team has to work cohesively to achieve success! The 2012 Dolphins with general manager Jeff Ireland, a first time head coach, and a rookie quarterback finished the season with an improved 7-9 record and second place divisional standing! They were also the most exciting Miami-based football team we have seen around these parts in a long time. It all starts with a healthy co-existence between the general manager and head coach. Maybe we finally have our most desired franchise quarterback, though for that to come to full fruition, we must have total cohesion among the brass during that quarterback's growth. Jeff Ireland was a puppet to Bill Parcells, and once he gained control of the strings he was not about to be influenced by the Parcells-hired head coach Tony Sparano. An NFL team cannot be successful without the Head Coach's input toward acquisitions, who, in all rights, has the most knowledge of his team and what it needs. Just ask the hypocrite Parcells. But, the general manager's seat was as white hot as the coaches! Who can blame Ireland for coming to his own conclusions during those particular moments in time? 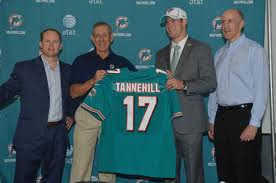 What is most annoying is that he is erroneously the most disliked figure in Miami Dolphin history to a majority of their fans, mostly because he is discredited for the two year's worth of acquisitions made by Parcells! As far as fan appreciation of the team goes, the Dolphins are practically in a no-win situation. With a majority of fans being so disenchanted with Ireland's efforts that they will always have difficulty totally supporting the team until he is gone. Others might think that Ireland should be fired with the same thought of how Ross fired Sparano because of his questionable tenure. Shoot, most of the folks that are still willing to let him ride it out won't be distraught if he were to be replaced. However, if Jeff Ireland were to forever be forced from our lives, then his potential replacement might not like Joe Philbin, Mike Sherman, Ryan Tannehill, the west coast offense, or the 3-4 Defense. Then, the 2012 season might become a totally wasted endeavor. For many, Jeff Ireland's only saving grace to this point is the hiring of Head Coach Joe Philbin and the drafting of quarterback Ryan Tannehill. It is understood that those who want Ireland out of Miami have had such aspirations for many years and cannot be swayed under any circumstances, though none has ever offered an available replacement's name. In an attempt of the ultimate compromise between Pro- and Anti-Jeff Ireland Dolphin fans there is an in-house alternative. He is not hated, he will follow through with the team's current direction, and he does not have the despicable name of Jeff Ireland! This writer is of the belief that Ireland, in fear of his own job security, would have forced this gentlemen away from the organization a few years ago, and I was extremely surprised that this individual was retained this past year with a promotion to assistant general manager. This was possibly another move that won't help the longevity of Ireland, but then again it is possibly further proof that Ireland has become a team player. 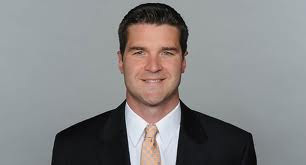 At this Black Monday moment, if a replacement at general manager is what has to be, please consider this recommendation of Assistant General Manager Brian Gaine. Brian Gaine. Looks like a nice enough, intelligent fellow with a personality that the fans could find hope in hearing speak, and his name alone suggestively speaks of production. I am not going to bother you with his history or ability. I will leave that to those who are interested in researching for themselves, because quite honestly, for most, all that matters is that his name is not Jeff Ireland. For the sake of only the Miami Dolphin franchise and not the fans a general manager who can productively co-exist with head coach Joe Philbin is what has to be. Therefore the most likely candidates are already Miami Dolphins! It is time to make your peace with the general manager issue, get on board with the experienced new leaf-turning Jeff Ireland, state your case for Brian Gaine, offer a name of your own who is willing to co-exist with Joe Philbin, or forever hold your peace on the issue while totally supporting the Dolphin organization through thick and thin. How do we get EVERYBODY (fans included) on the same page at the same time for total support toward the 2013 Miami Dolphins? THANK YOU for an open-minded read, and we look forward to your angle of view :) ! !